C# includes a special type of collection which stores elements in LIFO style (Last In First Out). C# includes a generic and non-generic Stack. Here, you are going to learn about the non-generic stack. Stack allows null value and also duplicate values. It provides a Push() method to add a value and Pop() or Peek() methods to retrieve values. The following diagram illustrates the Stack class hierarchy. Count Returns the total count of elements in the Stack. 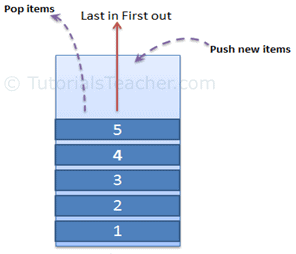 Contains Checks whether an item exists in the stack or not. The Push() method adds values into the Stack. It allows value of any datatype. You can retrieve stack elements by various ways. Use a foreach statement to iterate the Stack collection and get all the elements in LIFO style. The Peek() method returns the last (top-most) value from the stack. Calling Peek() method on empty stack will throw InvalidOperationException. So always check for elements in the stack before retrieving elements using the Peek() method. You can also retrieve the value using the Pop() method. The Pop() method removes and returns the value that was added last to the Stack. The Pop() method call on an empty stack will raise an InvalidOperationException. So always check for number of elements in stack must be greater than 0 before calling Pop() method. 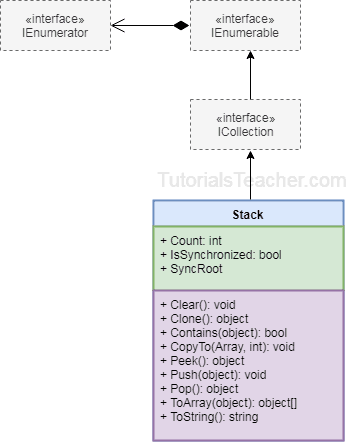 The Contains() method checks whether the specified item exists in a Stack collection or not. It returns true if it exists; otherwise it returns false. The Clear() method removes all the values from the stack. Stack stores the values in LIFO (Last in First out) style. The element which is added last will be the element to come out first. Use the Push() method to add elements into Stack. The Pop() method returns and removes elements from the top of the Stack. Calling the Pop() method on the empty Stack will throw an exception. The Peek() method always returns top most element in the Stack. Visit MSDN for more information on Stack member properties and methods.